It was billed as "the game of the year" in college football: two unbeaten teams, the number-one Miami Hurricanes against number-two Alabama for the 1992 National Championship. In the end, Bama proved why its defense was considered the best in the nation by shutting down the vaunted Hurricane passing attack in a 34-14 Sugar Bowl victory. 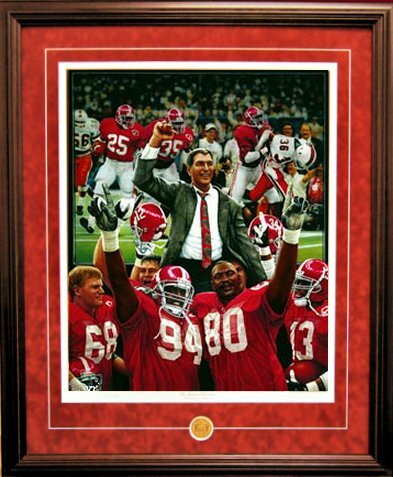 Featured is coach Gene Stallings, who brought the Crimson Tide back to a national prominence and recognition enjoyed by Alabama that until then, only Bear Bryant had been able to achieve. The left split screen depicts Derrick Lassic following the blocking of Martin Houston. The right split screen depicts George Teague's taking the football away from Lamar Thomas. Coach Stallings is shown on the backs of his players surrounded by MVPs George Wilson, John Copeland, Eric Curry, and George Teague. Two helmets represent the final score 34-13 and the number 12 helmet heralds Bama's 12th national title.